Chumash pictographs possibly dating to 500 AD. Simi Valley was once inhabited by the Chumash people, who also settled much of the region from the Salinas Valley to the Santa Monica Mountains, with their presence dating back 10,000–12,000 years. Around 5,000 years ago these tribes began processing acorns, and harvesting local marshland plants. Roughly 2,000 years later, as hunting and fishing techniques improved, the population increased significantly. Shortly after this sharp increase a precious stone money system arose, increasing the viability of the region by offsetting fluctuations in available resources relating to climate changes. The native people who inhabited Simi Valley spoke an interior dialect of the Chumash language, called Ventureño. Simi Valley's name derived from the Chumash word Shimiyi, which refers to the stringy, thread-like clouds that typify the region. The name could have derived from strands of mist from coastal fog that move into the Oxnard Plain and wind their way up the Calleguas Creek and the Arroyo Las Posas into Simi Valley. The origin of the name was preserved because of the work of the anthropologist John P. Harrington, whose brother, Robert E. Harrington lived in Simi Valley. Robert Harrington later explained the name: "The word Simiji in Indian meant the little white wind clouds so often seen when the wind blows up here and Indians living on the coast, would never venture up here when those wind clouds were in the sky. The word Simiji was constructed by whites to the word Simi. There are other explanations about the name Simi, but this one was given to me by my brother who worked over 40 years for the Smithsonian Institution and it seems most plausible to me". Three Chumash settlements existed in Simi Valley during the Mission period in the late 18th and early 19th century: Shimiyi, Ta’apu (present-day Tapo Canyon), and Kimishax or Quimisac (Happy Camp Canyon west of Moorpark College). 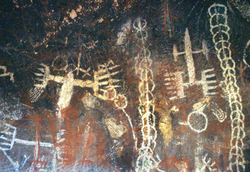 There are many Chumash cave paintings in the area containing pictographs, including the Burro Flats Painted Cave in the Burro Flats area of the Simi Hills, located between the Simi Valley, and West Hills and Bell Canyon. The cave is located on private land owned by Boeing, formerly operated by Rocketdyne for testing rocket engines and nuclear research. Other areas containing Chumash Native American pictographs in the Simi Hills are for instance by Lake Manor and Chatsworth. The first Europeans to visit Simi Valley were members of the Spanish Portolá expedition (1769–1770), the first European land entry and exploration of the present-day state of California. The expedition traversed the valley on January 13–14, 1770, traveling from Conejo Valley to San Fernando Valley. They camped near a native village in the valley on the 14th. Rancho Simi, also known as Rancho San José de Nuestra Senora de Altagracia y Simi, was a 113,009-acre (457 km2) Spanish land grant in eastern Ventura and western Los Angeles counties given in 1795 to Francisco Javier Pico and his two brothers, Patricio Pico and Miguel Pico by Governor Diego de Borica. Rancho Simi was the earliest Spanish colonial land grant within Ventura and Santa Barbara Counties. The name derives from Shimiji, the name of the Chumash Native American village here before the Spanish. It was one of the largest lands, but later when Mexico became independent from Spain, land was handed out much more freely. The Simi Adobe-Strathearn House, later the home of Robert P. Strathearn, served as the headquarters of the rancho. José de la Guerra y Noriega, a Captain of the Santa Barbara Presidio, who had begun to acquire large amounts of land in California to raise cattle, purchased Rancho Simi from the Pico family in 1842. A few years after Jose de la Guerra's death in 1858, the rancho was sold to the Philadelphia and California Petroleum Company headed by Pennsylvania Railroad president, Thomas A. Scott. When no great amount of oil was discovered, Scott began to sell the rancho. In 1887, a portion of the rancho was bought by a newly formed company, the Simi Land and Water Company. The small colonial town known as "Santa Susana del Rancho Simi" throve in the late 19th century and had a Spanish-speaking majority, but since then many Anglo-Americans have arrived to settle. Farms, orchards and groves dominated the valley's landscape until the 1970s. The 2,848 acres (1,153 ha) Santa Susana Field Laboratory located in the Simi Hills, was used for the development of pioneering nuclear reactors and rocket engines beginning in 1948. The site was operated by Atomics International and Rocketdyne (originally both divisions of the North American Aviation company). The Rocketdyne division developed a variety of liquid rocket engines. Rocket engine tests were frequently heard in Simi Valley. The Atomics International division of North American Aviation designed, built and operated the Sodium Reactor Experiment, the first United States nuclear reactor to supply electricity to a public power system. [Also from Wikipedia: The Boiling Water Reactors (BORAX) experiments were five reactors built between 1953 and 1964 by Argonne National Laboratory. They proved that the boiling water concept was a feasible design for an electricity-producing nuclear reactor. One of the BORAX reactors (III) was also the first in the world to power a city (Arco, Idaho) on July 17, 1955. Both claims can not be correct. ] The last nuclear reactor operated at SSFL in 1980 and the last rocket engine was conducted in 2006. The SSFL has been closed to development and testing. The site is undergoing investigation and removal of the nuclear facilities and cleanup of the soil and groundwater. The Boeing Company, the US DOE, and NASA are responsible for the cleanup. In July 1959, the Sodium Reactor Experiment suffered a serious incident when 13 of the reactor's 43 fuel elements partially melted resulting in the controlled release of radioactive gas to the atmosphere. The reactor was repaired and returned to operation in September, 1960. The incident at the Sodium Reactor Experiment has been a source of controversy in the community. Technical analysis of the incident intended to support a lawsuit against the current landowner (The Boeing Company) asserts the incident caused the much greater release of radioactivity than the accident at Three Mile Island. Boeing's technical response concludes the monitoring conducted at the time of the incident, shows only the allowable amount of radioactive gasses were released, and a Three Mile Island-scale release was not possible. The case was settled, it is reported, with a large payment by Boeing. In September 2009, The U.S. Department of Energy sponsored a public workshop where three nuclear reactor experts shared their independent analysis of the July, 1959 incident. The Santa Susana Field Laboratory also hosted the Energy Technology Engineering Center. The center performed the design, development and testing of liquid metal reactor components for the United States Department of Energy from 1965 until 1998. Four officers of the Los Angeles Police Department (Stacey Koon, Laurence Powell, Timothy Wind, and Theodore Briseno) were accused of using unnecessary force in a March 3, 1991 beating of an African-American motorist Rodney Glen King. The case known as the Rodney King Trials was based on footage recorded on home video by a bystander (George Holliday). The now-famous video was broadcast nationally and globally and caused tremendous response because the beating was believed to be racially motivated. Due to the heavy media coverage of the arrest, Judge Stanley Weisberg of the California Court of Appeals approved a change of venue to neighboring Ventura County, using an available courtroom in Simi Valley for the state case against the officers. On April 29, 1992, a Ventura County jury acquitted three of the four officers (Koon, Wind, and Briseno) and did not reach a verdict on one (Powell). Many believed that the unexpected outcome was a result of the racial and social make-up of the jury, which included ten whites, one Filipino, and one Hispanic. None were Simi Valley residents. Among the jury were three who had been security guards or in military service. The acquittal led to the 1992 Los Angeles riots and mass protest around the country. Simi Valley is a city located in the very southeast corner of Ventura County, bordering the San Fernando Valley in Los Angeles County, and is a part of the Greater Los Angeles Area. The City of Simi Valley basically consists of the eponymous valley itself. City of Simi Valley borders the Santa Susana Mountains to the north, the Simi Hills to the east and south, and is adjacent to Thousand Oaks to the southwest and Moorpark to the west. Simi Valley is connected to the nearby San Fernando Valley by the Santa Susana Pass in the extreme east of Simi Valley. Simi Valley is located at 34°16'16" North, 118°44'22" West (34.271078, −118.739428) with an elevation of 700–1,000 ft (210–300 m) above sea level. The syncline Simi Valley is located in the western part of the region called the Transverse Ranges. The valley is surrounded by the Santa Susana Mountains to the north and Simi Hills to the east and south. While the Santa Susana Mountains separate the valley from the Los Padres National Forest in the north, the Simi Hills separate it from Conejo Valley in the south. In the extreme east is Rocky Peak, one of Santa Susana Mountains' highest peaks, which is a dividing line between Ventura County to the west and Los Angeles County to the east. On the other side of the valley, in the extreme west side of Simi Valley is Mount McCoy, which may be most known for its 12 ft. concrete cross that sits at its peak. The physiographical valley is a structural as well as a topographic depression. The Simi Valley, just as neighboring San Fernando Valley, owes its existence and shape to the faulting and folding of the rocks. It is essentially a structural valley and not wholly the work of erosion. It is drained by the Calleguas Creek and also its principal tributary, Conejo Creek. Both of these originate in the Santa Susana Mountains. According to the United States Census Bureau, the city has a total area of 42.2 sq mi (109.4 km2), comprising 41.5 sq mi (107.4 km2) of land and 0.77 sq mi (2.0 km2), or 1.81%, of it is water. 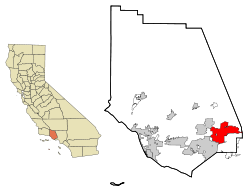 Simi Valley is located northwest of the Los Angeles neighborhood of Chatsworth and approximately 30 mi (48 km) from Downtown Los Angeles, 380 mi (610 km) south of San Francisco, 160 mi (260 km) north of San Diego, and 350 mi (560 km) south of Sacramento. Commutes to Los Angeles are usually via the Ronald Reagan Freeway (Highway 118) or the Southern California Metrolink commuter train, which makes several daily trips from Simi Valley. Simi Valley has a mediterranean climate. Temperate variations between day and night tend to be relatively big. The mean annual temperature is 64.1 degrees, while the annual precipitation is 18.39 inches. The precipitation remains less than one inch for seven months – April until October, – while the precipitation exceeds four inches in the two wettest months – January and February. While the mean temperature is at its lowest at 53.6 degrees in December, the mean temperature in July and August exceeds 76 degrees. Simi Valley has been the victim of several natural disasters, including the flood of 1967, the storm of 1983, the 1988 lightning strike, as well as the 1994 Northridge earthquake and numerous wildfires. Simi Valley has a warm and dry climate during summer when mean temperatures tend to be in the 70s. Wildfires do also occur here. The city's climate cools during winter when mean temperatures tend to be in the 50s. Because of its relatively low elevation, the Simi Hills typically experience rainy, mild winters. Snow is rare in the Simi Hills, even in the highest areas. The warmest month of the year is August with an average maximum temperature of 96 °F (36 °C), while the coldest month of the year is December with an average minimum temperature of 38 °F (3 °C). Temperature variations between night and day tend to be relatively large during summer, with a difference that can reach 38 °F (21 °C), and moderate during winter with an average difference of 29 °F (16 °C). The annual average precipitation in Simi Valley is 17.9 inches. Winter months tend to be wetter than summer months. The wettest month of the year is February with an average rainfall of 4.8 inches. Simi Valley gets 18 inches of rain per year, while the United States average is 37. Snowfall is 0 inches, while the U.S. average is 25 inches of snow per year. The number of days with measurable precipitation is 25. On average, there are 277 sunny days in Simi Valley per year. The July high is approximately 96 °F (36 °C). The January low is 39 °F (4 °C). The record low is 18 degrees Fahrenheit (−8 °C) (recorded in February 1989) and the record high is 116 degrees Fahrenheit (47 °C) (recorded in August 1985). The prevailing wind direction is southwest, and the average wind speed is 7–11 mph (11–18 km/h). An aspect of Simi Valley's location, situated beside the Simi Hills, is that it lies in a high-risk area for the wildfires that sweep through Southern California's mountain ranges every few years. Simi Valley is also at risk for earthquakes. The valley is surrounded by faults; the closest ones being the Santa Rosa Fault to the Northwest, the Northridge Hills Fault to the Northeast, and the Chatsworth Fault to the South. In 1994, portions of Simi Valley received significant damage from the Northridge earthquake. See Nuclear Accident at SSFL for information on the accident and associated risk(s) to residents. The 2010 United States Census reported that Simi Valley had a population of 124,237. The population density was 2,940.8 people per square mile (1,135.4/km²). The racial makeup of Simi Valley was 93,597 (75.3%) White, 1,739 (1.4%) African American, 761 (0.6%) Native American, 11,555 (9.3%) Asian, 178 (0.1%) Pacific Islander, 10,685 (8.6%) from other races, and 5,722 (4.6%) from two or more races. Hispanic or Latino of any race were 10,938 persons (23.3%); 16.2% of Simi Valley's population are Mexican-American, 1.2% Salvadoran, 0.9% Guatemalan, 0.6% Puerto Rican, 0.6% Peruvian, 0.3% Cuban, 0.3% Argentine, 0.2% Honduran, 0.2% Nicaraguan, and 0.2% Ecuadorian. Among Asian-Americans, 2.7% of Simi Valley's population were Indian-Americans, 2.2% Filipino, 1.2% Chinese, 1.0% Vietnamese, 0.7% Korean, 0.5% Japanese, 0.2% Thai, 0.1% Pakistani. The majority of Simi Valley's population is made up of Caucasian-Americans; the largest groups of whites were 16.7% German-American, 11.3% English, 8.5% Italian, 3.4% French, 3.1% Polish, 2.3% Norwegian, 2.3% Swedish, 2.1% Scottish and 2% Dutch. As of the census of 2000, there are 111,351 people, 36,421 households, and 28,954 families residing in the city. The population density is 1,097.3/km² (2,841.9/mi²). There are 37,272 housing units at an average density of 367.3/km² (951.3/mi²). The racial makeup of the city is 81.33% White, 1.26% Black or African American, 0.70% Native American, 6.33% Asian, 0.14% Pacific Islander, 6.50% from other races, and 3.74% from two or more races. 16.82% of the population are Hispanic or Latino of any race. According to a 2007 estimate, the median income for a household in the city was $88,406, and the median income for a family is $91,658. 10.2% of the population and 7.4% of families were below the poverty line. In 2016, the median income for a household in Simi Valley has decreased to $90,210 according to the U.S. Census Bureau. The median per capita income for the past 12 months (2015) is $37,459. Sales tax is at 7.25% and income taxes are at 8.00%. The current unemployment rate is at 4.80% with a 0.36% recent job growth compared to the National Unemployment Rate of 5.20% and a 1.59% job growth. The median cost of homes in Simi Valley is $450,500 with mortgages at a median of $2,456. 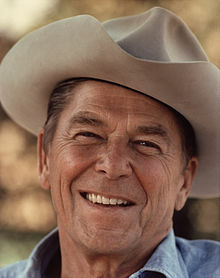 President Ronald Reagan is buried in Simi Valley, oftentimes nicknamed "Reagan Country". Simi Valley is considered a conservative stronghold politically, along with the neighboring City of Thousand Oaks. The electorate is often described as solidly Republican. Numerous publications have described Simi Valley among the most conservative cities in the United States; Simi Valley was for instance ranked the 18th most Conservative city in the country in 2005 by GovPro.com. In the 2004 presidential election George W. Bush (R) won nearly 61% of the vote, compared to 44% statewide, while John Kerry (D) won 38% of the vote. In the 2008 presidential election, Barack Obama (D) won 47% of Simi Valley, while John McCain (R) won 52% of the vote. In the 2012 presidential election, Barack Obama won 43% of the vote, while Mitt Romney (R) won 55% of the vote. Republican Bob Huber has been the incumbent mayor since 2010. The former Republican president and California governor, Ronald Reagan, is buried at the Ronald Reagan Presidential Library on a hilltop by the Thousand Oaks-Simi Valley city limits. The presidential library is frequently visited by conservative speakers and has been hosting numerous Republican primary debates, including the first debate in the 2008 presidential election, the 2012 presidential election, and the second primary debate for the 2016 presidential election. Simi Valley is located within the 25th congressional district, represented by Katie Hill. The Simi Valley as well as neighboring Chatsworth are among the most Republican communities in the Greater Los Angeles Area, and the 25th district is among the most conservative in the State of California. In November of 2018, Katie Hill unseated Republican Steve Knight and became the first democratic woman to represent the district in the House of Representatives. Simi Valley's government uses the "Council-Manager" form of government. This means that the city council is composed of one mayor, elected every two years, and four council members elected for four-year terms. The city council appoints both the city attorney and city manager, who heads the executive branch of the city government. The city manager appoints the various department heads for the city, and acts as the city clerk and city treasurer. According to the city's most recent Comprehensive Annual Financial Report Fund Financial Statements, the city's various funds had $89.3 million in Revenues, $86.3 million in expenditures, $139.9 million in total assets, $26.1 million in total liabilities, and $158.5 million in investments. In the state legislature, Simi Valley is in the 27th Senate District, represented by Democrat Henry Stern, and in the 38th Assembly District, represented by Democrat Christy Smith. 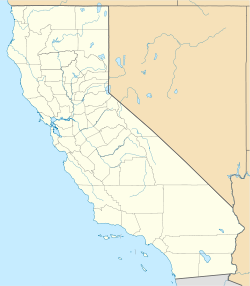 In the United States House of Representatives, Simi Valley is split between California's 25th congressional district, represented by Democrat Katie Hill, and California's 26th congressional district, represented by Democrat Julia Brownley. Simi Valley is home to the Ronald Reagan Presidential Library, which has been visited by almost 400.000 people in 2014. After a major state funeral in Washington, D.C., President Reagan was buried at the library in June 2004. The library adjoins a hangar in which the Boeing 707 SAM 27000 (Air Force One), which served presidents Nixon through G.W. Bush, is housed and available for tours. In the pavilion are various automobiles used to transport the president, as well as Marine One, the presidential helicopter. The former Corriganville Movie Ranch and its Fort Apache film set, now Corriganville Regional Park, is the Santa Susana Knolls. Many television series were filmed there during the 1950s, such as Richard Carlson's Mackenzie's Raiders though that program was set at the former Fort Clark near Brackettville in southwestern Texas. Other areas of filming includes Big Sky Ranch, where the Little House on the Prairie was filmed, Poltergeist was filmed on Roxbury Street, and Welcome Danger (1929) and numerous others in Santa Susana. NO. 979 Rancho Simi – This is the site of the headquarters of the Spanish Rancho San José de Nuestra Senora de Altagarcia y Simi. The name derives from 'Shimiji,' the name of the Chumash village here before the Spanish. At 113,000 acres (460 km2), Rancho Simi was one of the state's largest land grants. Two prominent Spanish and Mexican family names are connected with the Rancho: Santiago Pico who first received the grant, and José de la Guerra who purchased the Rancho in 1842. Two rooms of original adobe remain, part of the Strathearn home built in The Strathearn Historical Park and Museum, an open-air park that is owned and maintained by the Rancho Simi Recreation and Park District, and is operated jointly with the Simi Valley Historical Society. The house is maintained as a historic house museum with typical period furniture and household displays. In addition to the Simi Adobe-Strathearn House, there are various historic buildings and structures that have been moved from their original site to the park, including the 1924 children's playhouse with toys, the 1902 St. Rose of Lima Catholic Church, the original Simi Valley Library and two barns with farm tools and equipment. Listed on the National Register of Historic Places: NPS-78000825. Location: Robert P Strathearn Historical Park, 137 Strathearn Place, Simi Valley. The Montalvo Cutoff, a railroad line opened by the Southern Pacific Railroad on March 20, 1904, to improve the alignment of its Coast Line, runs east-west through the valley. In 1905, the longest train tunnel in the United States at that time was completed at the east end of Simi Valley. Tunnel #26 still stands today linking Simi Valley and the San Fernando Valley. The area was originally served by the Santa Susana Depot which was also opened in 1904 as a combination passenger and freight depot built by the Southern Pacific and located on Los Angeles Avenue near Tapo Street. The station remained in use for the following 60 years until changes in the business model for railroads evolved that rendered the depot useless to the railroad. The United States Postal Service operates the Simi Valley Post Office at 2511 Galena Avenue, the Kopy King Post Office at 2157 Tapo Street, and the Mount McCoy Post Office at 225 Simi Village Drive. Santa Susana High School has been named as a silver medal winner in U.S. News & World Report's "Top 500 Schools in America" for 2013 and 2014. Simi Valley High School was ranked among MSNBC's Top 1,000 High Schools in the country. 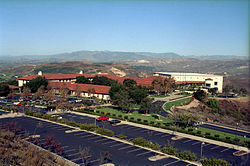 Simi Valley also has an adult school (Simi Adult School) and a cosmetology school. After splitting from the Ventura County library system, the Simi Valley Public Library opened in July 2013, operated by the City of Simi Valley. In its first year operating as a municipal library, it welcomed over 200,000 patrons into the library. Park facilities in Simi Valley operated by the Rancho Simi Recreation and Park District total fifty parks, where some are urban city-parks, while others are public open space or multi-purpose trail systems. The district has an inventory of 5,600 acres of public owned land, including hundreds of acres of land in the Simi Hills. The purpose of these areas are to preserve the native landscape, as well as function as a wildlife corridor that protects the natural habitat for wildlife and flora. The city also boasts six golf courses and the Kanan Ranch home development has nature trails for hikers, bicyclists and equestrians to enjoy. Two collegiate baseball teams: The Simi Valley Senators and the California Oaks of the California Collegiate League in Thousand Oaks, provide sports action to local fans. To the southwest, numerous trails are accessible for Mountain Biking, Hiking and Equestrian activities. The main access point for Wood Ranch Open Space is at the intersection of Wood Ranch Parkway and Long Canyon Parkway, but can also be accessed through nearby Challenger Park or from trailheads in Thousand Oaks. The trail system travels as far west as highway 23, as far east as the Rocketdyne facility and connects to the Lang Ranch trail system (Westlake Village) and Chesebro trail system, which begins in Agoura Hills. Simi Peak (the highest peak in Simi Valley) is accessible from this trail system via China Flats in the Chesebro trail system. Ahmundson Ranch connects to this trail system, again via the Chesebro trail system. Bridlepath, a private trail system also connects to the main fire road. The west end of Simi Valley is also home to the 150-acre Tierra Rejada Park, which offers hiking trails to nearby Moorpark, CA. The Simi Hills are the most critical wildlife corridor linkage from the Santa Monica Mountains — to the Santa Susana Mountains, and beyond to the Topatopa Mountains, San Gabriel Mountains, and other Transverse Ranges further east. The Simi's undeveloped native habitat provides routes that protect larger land wildlife of the Santa Monicas from genetic isolation. Large sections of the Simi Hills are protected by parks and open space preserves. Animals in the area include mammals such as the Virginia opossum, ornate shrew, broad-footed mole, mountain lion, mule deer, bobcat, spotted and striped skunk, California badger, southern California weasel, California raccoon, ringtail cat, black bear, Botta's pocket gopher, desert cottontail, valley coyote, gray fox, California vole, brush rabbit, California ground- and California grey squirrel, as well as several species of mice (California pocket mouse, western harvest mouse, brush mouse, deer mouse, and house mouse), rats (agile kangaroo rat, dusky-footed woodrat, black rat, roof rat, and brown rat) and bats (long-eared myotis, long-legged myotis, California myotis, small-footed myotis, western pipistrelle, Brazilian free-tailed bat, western mastiff bat, and Tejon myotis). Some of the reptiles in the area include several species of snakes (coachwhip, southern Pacific rattlesnake, San Diego night snake, striped racer, California black-headed snake, two-striped garter snake, San Diego gopher snake, coast mountain kingsnake, California kingsnake, coast patch-nosed snake, ringneck snake) and lizards (western fence lizard, California side blotched lizard, western skink, western whiptail, San Diego horned lizard, California horned lizard, San Diego alligator lizard, silvery legless lizard). There are ten species of amphibians in Simi Valley: the California newt, western spadefoot, California toad, arroyo toad, California slender salamander, arboreal salamander, American bullfrog, California red-legged frog, California treefrog, and the Pacific treefrog. Wild peacocks live by the canyons of Santa Susana Knolls. Birds in Simi Valley include Anna's hummingbird, Canada goose, mallard, California quail, common egret, great blue heron, American bittern, American coot, killdeer, mourning dove, roadrunner, belted kingfisher, black phoebe, barn swallow, cliff swallow, common raven, crow, white-breasted nuthatch, cactus wren, mockingbird, robin, cedar waxwing, phainopepla, starling, least Bell's vireo, hooded oriole, western tanager, several species of blackbird (western meadowlark, Brewer's blackbird and brown-headed cowbird) and woodpeckers (common flicker, Nuttall's woodpecker, acorn woodpecker, and yellow-bellied sapsucker). Raptors include turkey vulture, white-tailed kite, American kestrel, poor-will and several species of hawks (Cooper's hawk, sharp-shinned hawk, marsh hawk, red-tailed hawk, red-shouldered hawk, and the common nighthawk) and owls (great horned owl, short-eared owl, long-eared owl, barn owl, and the burrowing owl). Grosbeaks, finches and sparrows include black-headed grosbeak, house finch, American goldfinch, lesser goldfinch, California towhee, Savannah sparrow, sage sparrow, dark-eyed junco, white-crowned sparrow and the house sparrow. The popular 1970s television show Little House on the Prairie utilized an expansive collection of sets constructed throughout the hilly landscapes of Big Sky Ranch in the Tapo Canyon hills north of Simi Valley and Santa Clarita, California. In addition to the Little House itself, the entire set for the town of Walnut Grove was built atop the hills. After finishing his work on the series, Michael Landon blew up the town (which became part of the final movie) but the Little House itself was left intact. 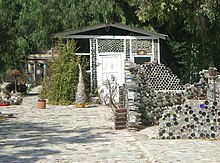 In July 2004, the house was destroyed by a devastating California wildfire. In 1983, Colleen McCullough's TV mini-series, The Thorn Birds, was brought to life in a remote corner of the Simi Valley. Australia presented too many hurdles for producers, the least of which was the restriction that only two American actors star in any movie filmed there; the rest had to be Australian. Location scouts went scouring, and Simi Valley, some of which strongly resembles parts of the Australian countryside, was chosen for the famous Cleary ranch and sheep station, Drogheda. In the 1984 film "Bachelor Party" starring Tom Hanks, the MANN 6 Movie Theater, formerly located within the Sycamore Shopping Center, was used for the movie theater scene. For the 1992 movie "Sneakers" with Robert Redford, the Gibraltar Savings building (later Countrywide at 400 Countrywide Way) was transformed to The Playtronics Toy company. The entire front lobby and hallways were redone for the movie and then returned to their original design. Some of the filming was done from hills across from the building. Many scenes were shot at night with the permission of the residents, due to the lighting required. In the 2001 comedy Joe Dirt, the character found his long-lost parents in a trailer home park in Simi Valley (On another version of the movie, it was changed to Yucca Valley, California). The video for "Hexagram," by The Deftones was filmed with fans watching the band play the song in an indoor skatepark in Simi Valley. The "Retail Rodeo" scenes from the Jennifer Aniston movie The Good Girl were filmed in the Ralph's shopping center on L.A. Ave. The set was constructed inside a vacant retail space. Nu-metal band Limp Bizkit filmed the music video for the single "Break Stuff" at Skatelab, a skate park in Simi Valley. The Patrick Swayze movie "Three Wishes" used a baseball field in Simi Valley, near the Santa Susana Pass. The 2009 Hallmark Channel movie "Always and Forever" was filmed in various locations throughout Simi Valley and Moorpark, California. In 2009 Gavin Rossdale filmed part of his music video "Forever May You Run" in an office building on 555 E. Easy Street in Simi Valley. ^ "Population Estimates — City and Town Totals: Vintage 2014". United States Census Bureau. May 21, 2015. Archived from the original on May 22, 2015. ^ Berman, Russell (October 31, 2014). "The First Republican Primary Debate for 2016 Is Set". The Atlantic. Retrieved May 11, 2017. ^ "2013 — A Year in Review". City of Simi Valley. January 21, 2014. Retrieved March 14, 2015. ^ a b Abcarian, Robin (May 7, 2017). "An aggravating anniversary for Simi Valley, where a not-guilty verdict sparked the '92 L.A. riots". Los Angeles Times. Retrieved May 7, 2017. ^ "Jury Sworn In for Police Beating Case". New York Times. February 23, 1993. ^ "No social conservative on the '08 ballot?". May 3, 2007. ^ "Endorsement: Steve Knight for Congress in California's 25th District". May 8, 2014. Retrieved May 11, 2017. ^ "Post Office Location – SIMI VALLEY." United States Postal Service. Retrieved on December 6, 2008. ^ "Post Office Location – KOPY KING." United States Postal Service. Retrieved on December 6, 2008. ^ "Post Office Location – MOUNT MCCOY." United States Postal Service. Retrieved on December 6, 2008. This page was last edited on 10 April 2019, at 21:52 (UTC).